Elon Musk, founder and president of Space Exploration Technologies (SpaceX). The third time may be acharm, but even if it is not SpaceX's founder says he is committed to thelaunch business and now regrets having said two years ago that he probablywould have only three chances to launch his Falcon 1 rocket successfully. 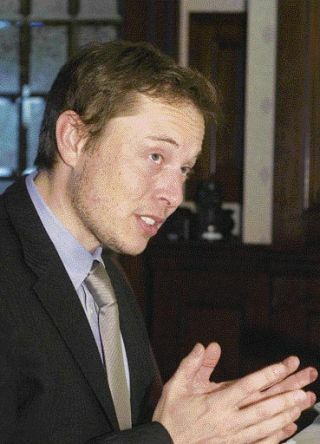 In the run up to theFalcon 1 rocket's 2006 maiden flight, Elon Musk, founder and president of SpaceExploration Technologies (SpaceX), said he would be inclined to call it quitsif he could not pull off a successful launch within three tries. On thatfirst flight, the Falcon 1's main engine caught fire and failed 29 secondsafter liftoff, leading to the loss of the vehicle and payload, a smallexperimental satellite built by U.S. Air Force Academy cadets. A year later, a secondFalcon 1 was back on the pad, ready to try again, this time without a satelliteon board. After an encouraging liftoff that saw the privately-financed Falcon 1reach space for the first time, a control issue caused the rocket'skerosene-fueled main engine to shut down about 90 seconds too soon. Once again,the $6-million Falcon 1 had failed to achieve orbit. With a third Falcon 1launch attempt fast approaching, the 36-year-old serial entrepreneur is distancinghimself from his three-and-out remark and assuring customers and his 470employees that he is in the launch game for the long haul. "I made a stupidcomment once," Musk told reporters during a May 14 lunch here sponsored bythe Space Foundation. "I was asked, 'how many failures can you withstand? 'I said, 'well, if we had three failures in a row, then I suspect we would notget any customers, and then it wouldn't make sense to continue.' I waspartially quoted thereafter saying, 'three failures and we're out.' That'sactually not the full statement. The full statement was if our customersabandon us, then we are out." Six years have passedsince Musk started SpaceX to bring about the cheaper launches he sees as anecessary precondition for humanity fulfilling its potential as a trulyspacefaring civilization. Although fielding a reliable, low-cost launcher istaking longer than he once hoped, Musk said he is not about to throw in thetowel. "We are in this forthe long term," Musk said. "SpaceX will never give up. I will nevergive up. Never." With a backlog of 12launches on the manifest through 2011 and a newly inked launch servicesagreement with NASA potentially worth $1 billion, the Hawthorne, Calif.-basedcompany actually managed to add new customers to its roster since the March2007 launch attempt left the Falcon 1 with an 0-2 record. Musk, however, makes thecase that the Falcon 1's record should be amended to 1-1, or at least carrysome sort of asterisk noting that thesecond launch was a confidence-boosting success "from a teststandpoint" even if the rocket did not reach orbit. "Given that afterour last launch we signed up several new customers, I think it's safe to saythat we can count that last launch as a success in the eyes of our customerswhich is really where it counts," he said. And nothing gets Musk'sback up like characterizing Falcon's second flight as a launch failure. "One of the thingsthat was very annoying was how the flight was described by some people in themedia, frankly, who seem to be sort of 'the glass is one-tenth empty.' Youknow? I mean really," he said. However, Musk latervolunteered that launching satellites, unlike designing software or buildingelectric cars — two other endeavors he knows well ? is an unforgiving business. Once the rocket leavesthe pad, no amount of software updates or mechanical recalls will give thecustomer a working satellite if it fails to reach orbit safely. "You have to geteverything right," he said. "The passing grade is 100 percent." Musk made clear that hewill hold Falcon 1 to the unforgiving pass-or-fail grading criteria during itsupcoming launch for the Pentagon's Operationally Responsive Space (ORS) programoffice, calling the planned late-June mission an "operational flight"as opposed to a test. The payload for themission has not been assigned, although a senior ORS official said in lateApril that the U.S. Air Force Research Laboratory's Plug and Play satellite isthe top candidate for the mission, dubbed Jumpstart. Should Plug and Play notbe ready to go in time, the official said, SpaceX will be asked to launch eitherthe Trailblazer satellite, built by SpaceDev Inc., or CUSat, which wasdeveloped under a partnership between the Air Force and Cornell University. SpaceX, for its part,will not be informed of the Pentagon's payload selection until two weeks beforelaunch, which Musk said is targeted for "approximately the last week of June." He said the rocket'sfirst stage is already in place at the company's private island launch complexin the Kwajalein Atoll, with the second stage to join it there in a"couple of weeks." Musk refused to be pinneddown on a precise launch date, however, telling reporters SpaceX would take allthe time it needs to get it right. "At the end of theday we are not going to rush this flight," he said. It also is clear SpaceXis not counting on the old adage "third time's the charm" to ensure asuccessful launch. Musk put the odds of a successful next flight at "85 to90 percent."